I just got back from a looooong (summer) break. The kids were at home and the days were completely occupied by god only knows what we did. Getting back and settling into a routine feels nice. It’s made me feel relaxed. The relaxation has resulted in yet another Indo-Mexican fusion. 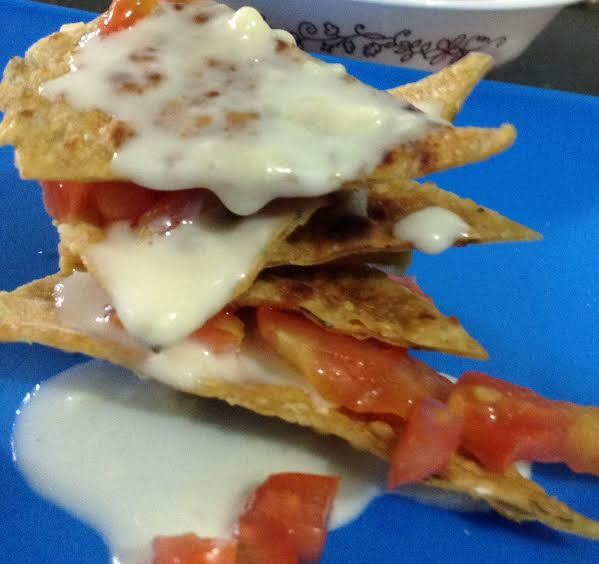 The Nachos – Indian style! 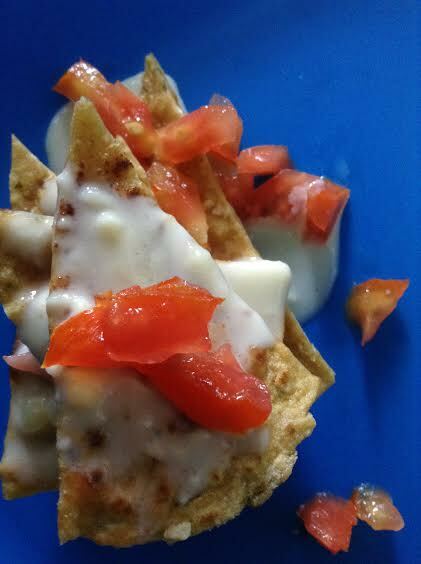 When the idea to do something with nachos struck, I wanted to combat the blandness of tortilla (flat bread made with corn), which is used as the base. 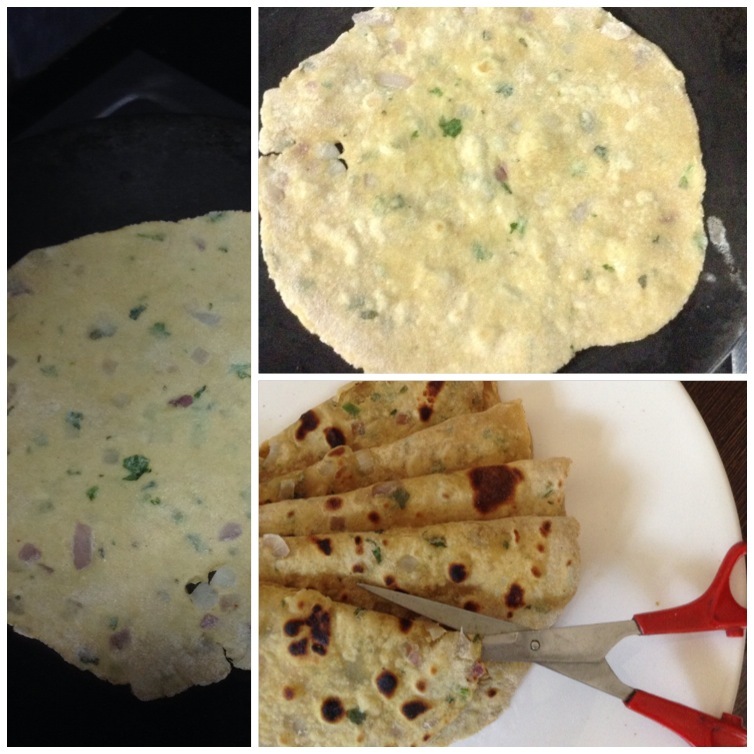 The solution is a spicy masala roti instead of the regular tortilla, to be used as the base. Added to that, a cheesy sauce with some interesting toppings and voila! What better way to have a yummy, healthy snack than nachos with whole wheat? Combine the above ingredients and make a stiff dough. Roll them into thin rotis. 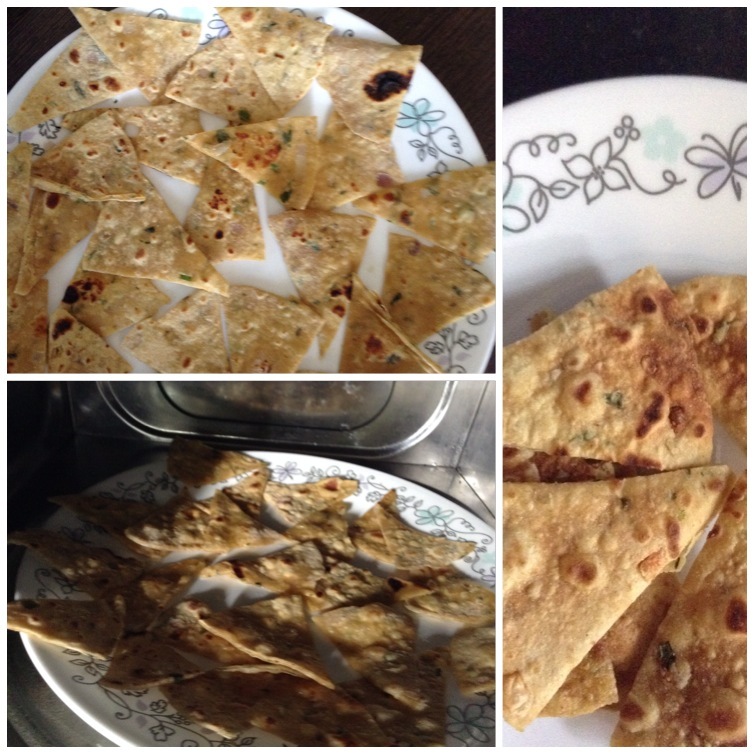 Cook each roti both sides on a skillet / tawa till it gets golden brown spots. 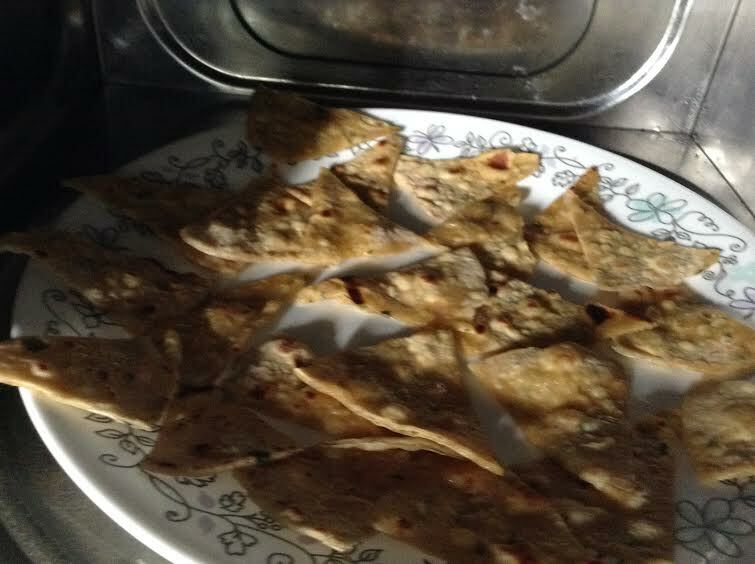 The next step is to make the rotis crispy, just right for nachos. For that, you can bake them in an oven. But I had to add my twist here – microwave and make them crispy! 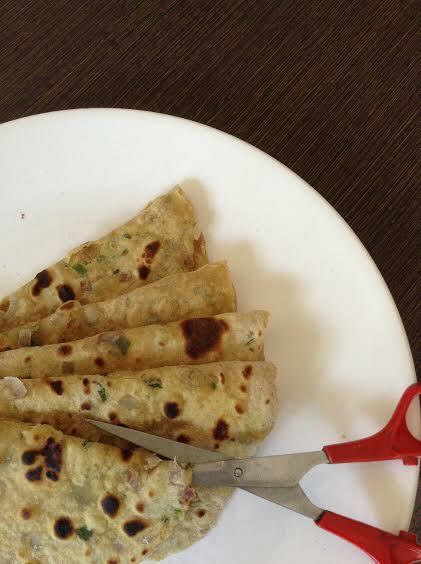 Cut the cooked rotis into triangles. Arrange them on a microwave safe plate. Microwave on high for 2 minutes by turning them over once in between. Note: Just ensure that the triangles are spread evenly and don’t overlap each other. 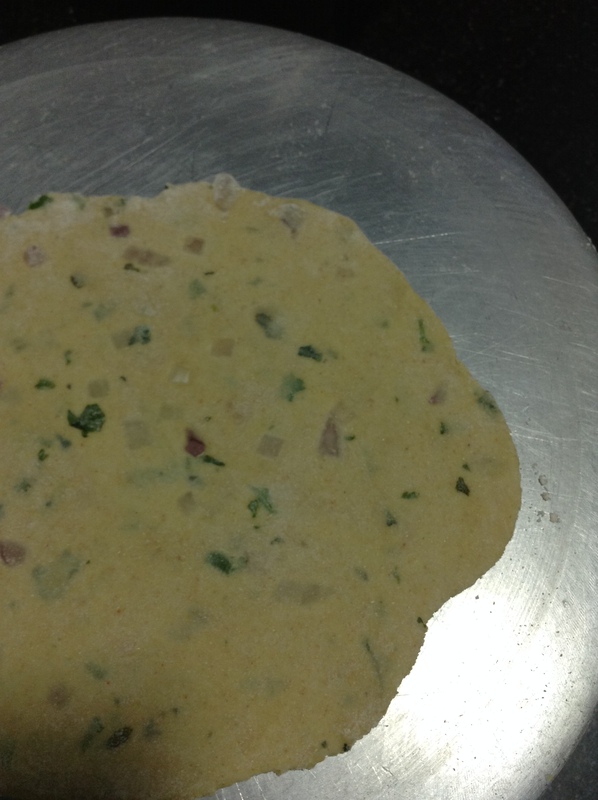 You can accommodate the cut pieces of two medium-sized rotis in one plate. Allow the pieces to cool down, and then they are ready to be assembled into yummy nachos! Slightly heat the milk, cheese mixture till the cheese melts. I microwaved it for 30 seconds on medium heat. Add minced garlic and sprinkle oregano on top and keep aside. You can opt to choose between tinned olives, jalapenos or capsicum, onions or whatever you fancy. Just go wild with your imagination! Arrange the crispy masala roti chips on a plate. Pour the cheese sauce and drop the toppings randomly on top. Microwave for 30 seconds on high and your steaming homemade nachos are ready. Even the normal roti would just work fine for making nachos. Crisp them (as described above) and they are ready to get converted into a yummy snack. That’s sure a great way to use up left over rotis. It is definitely a great starter / snack option. Say Cheese! Coz we are discussing about cheese here. Cheese is basically a compact, preservable form of milk. Milk is supposedly 80% water. When the water from milk is separated and the remaining solid is compressed, we get cheese. Simple, no? The cheese most commonly made in Indian homes is cottage cheese or paneer. This kind of cheese is made by adding either lemon juice or vinegar to boiling milk. The milk curdles and the solids are separated from whey by using a cheese cloth. The solid is then hung for about an hour to drain. It is then compressed by placing under a heavy object for several hours. Paneer is a family favourite in our home. So I make it once a week and stock it. Sometimes I prefer not to compress it and use it for dishes such as paneer, veg curry or paneer paratha where crumbled paneer is used. The gouda cheese, which is a Dutch variety, is slightly yellowish in colour and goes well with fruits and wine. Slowly, I can see a lot of cheese varieties entering the supermarkets. Since there are numerous varieties of cheese, here I am just introducing the most common ones available in India. Any kind of cheese is rich in protein and calcium, apart from the various other nutritional benefits it offers. It is best to make cheese part of kids’ diet plan. It really helps to meet the recommended daily doses of protein and calcium. Especially when kids are fussy about drinking milk, make sure their lunch box contains cheese. Soft cheeses have high moisture while hard cheeses have less, thus making them less perishable. How to Buy Look for the date of manufacture. Fresher it is, the better. Usage If served as an accompaniment to any other food, all cheeses have to be served at room temperature. For cooking purposes, use as required and carefully store the rest. For more detailed information on cheese, visit this page http://www.gardemanger.com/cheese.html which I found to be very informative.